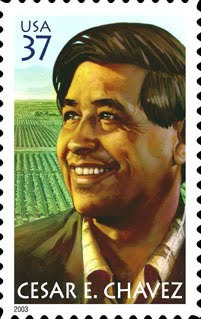 March 31st is Cesar Chavez's birthday. California state workers (but not teachers) are home right now on a state-paid holiday to observe the birthday of the former head of the United Farm Workers. Two of my fellow teachers at my site are Chicano activists who have a poster in their classrooms that reads No Human is Illegal! They also unsurprisingly revere Cesar Chavez. How ironic that if Cesar Chavez in his heyday had walked into these two classrooms and saw those posters, he would have shaken his head in disgust. I have mentioned this before, but it bears repeating, that when Cesar Chavez was fighting for higher wages and better working conditions for southwestern farm workers, he despised illegal immigration, and went so far as to alert la migra - the Immigration and Naturalization Service (INS) - about cases of illegal immigrants working in the fields. Here's the ironic part: Despite the fact that Chávez is these days revered among Mexican-American activists, the labor leader in his day was no more tolerant of illegal immigration than the Arizona Minutemen are now. Worried that the hiring of illegal immigrants drove down wages, Chávez – according to numerous historical accounts – instructed union members to call the Immigration and Naturalization Service to report the presence of illegal immigrants in the fields and demand that the agency deport them. UFW officials were even known to picket INS offices to demand a crackdown on illegal immigrants. And in 1973, in one of the most disgraceful chapters in UFW history, the union set up a "wet line" to prevent Mexican immigrants from entering the United States. Under the guidance of Chávez 's cousin, Manuel, UFW members tried at first to convince the immigrants not to cross. When that didn't work, they physically attacked the immigrants and left some bloody in the process. It happened in the same place that the Minutemen are now planning to gather: the Arizona-Mexico border. What I find vexing is watching all these supporters of illegal immigration yelling "Viva!" to Cesar Chavez, even though he opposed that which they fanatically support. I just got the newest issue (March 2011) of California Educator, the official union rag of the California Teachers Association. Although I am no longer a member of the CTA, my wife still is, so we still receive this sometimes unintentionally humorous magazine. I must commend them though; they actually ran an article that touched on an important educational topic and didn't totally trash my views, as they are wont to do. The article in question addresses one of my pet peeves about teacher accountability, and that is state standards tests. Too many members of the public out there do not realize that these tests, which are given every spring and are used to measure the success of a school and its teachers, leave the students more or less unaccountable. Every year, we have to buffalo our students into doing well on the tests by exaggerating or even straight up lying about the importance of the tests on their academic career. In reality, a student doesn't even have to take the test if the parent doesn't want him to, and if the student doesn't take the test, the school is held accountable. If students score "proficient" or "advanced" on the California Standards Test (CST), they can raise their semester grade by one level. Students can go from an F to a D, for example, which can mean the difference between failing a class and passing. It's a radical departure from other schools, where students who perform well on standardized tests do not receive any direct benefit and teachers become frustrated by students filling in the bubbles at random. ...those willing to take such a gamble are in the minority, and... if it does work for students, there's no harm done. "Homework is a learning aid," says [Junior Andrew] Napier. "This system rewards students based on their knowledge, and not on whether they complete meaningless busywork. If you understand the material and do well on your CSTs, what is the point of homework?" While I will not completely agree with young Mr. Napier on the value of homework, I do agree that test performance should count more toward a final grade than completion of homework. As the article points out, testing out of a subject so you don't have to take a class is common in colleges. In fact, I tested out on several subjects to get my undergraduate degree. Naturally, not everyone is a fan of Del Norte High's CST policy. Critics include the school's Social Studies department (what do those Social Studies guys know anyway? ), some local parents, and the ACLU. The article doesn't do a great job of voicing their objections beyond a quote from one of the Social Studies teachers who "fears that the policy could be unfair to students who are unable to raise their grades." Because the state of California, our legislators, and the governor are holding schools accountable with the use of this exam and it has no bearing on a student's grade, I applaud my teachers for coming up with a way to utilize the scores to bring value of this test to students." How different the world would be today if Hinckley and his bullets had found their mark even worse than they had, especially considering the economic success of the Unites States during the 1980s, and the fall of communism in the Soviet Bloc. As it is, it turns out that Ronald Reagan came much closer to dying that day then many of us realized for many years. I read somewhere recently that by the time he went into surgery, he had lost something like a third of his blood. In true Ronald Reagan fashion, he managed to utter a memorable quip. Before his doctors began their surgery to remove the .22 caliber bullet from his lung, Reagan famously said to the medical staff, "I hope you're all Republicans." Never forget that in addition to Reagan, three other people were shot that day. Press Secretary James Brady has never fully recovered from the injuries he received. 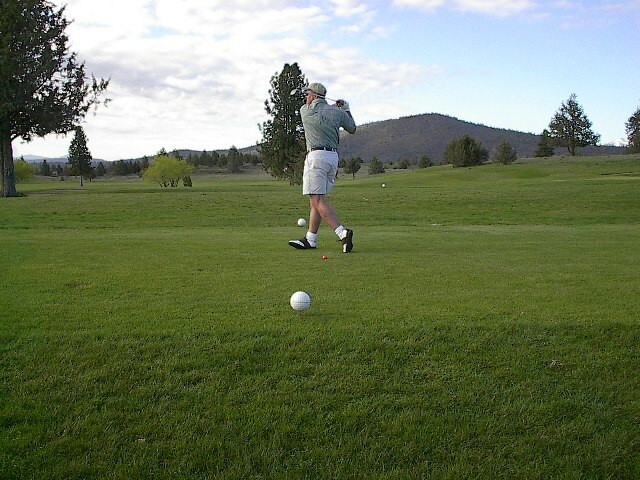 His brain was permanently damaged by the bullet that entered the left side of his head. Washington D.C. police officer Thomas Delahunty was shot in the shoulder and neck, and took months to recover from his serious wounds. Secret Service agent Tim McCarthy, who was not wearing a bulletproof vest, courageously turned his body toward the sound of the gunfire to act as a human shield to President Reagan, and took a bullet in the chest. McCarthy has been credited with saving the President's life. We all remember those significant news events by which we chart our lives. For my parents, it was Kennedy's assassination. For me it was the Challenger tragedy. For many of us, it is now the terrorist attacks of 9/11/01. Before all that, however, my first significant news story that I remember as a child was the attempted assassination of President Ronald Reagan. Let us fast-forward to 2011. Now that Barack Obama has jumped in to his own little war in Libya, that whole "dissent is patriotic" thing? Yeah, to hell with that, say the statists. MSNBC host Cenk Uygur - a more annoying twit you will have trouble finding - declared yesterday that it is "unpatriotic" to oppose Obama's Libya actions. His guest, Democrat congresscritter Gary Ackerman, stated that to criticize Obama regarding Libya is to "cheer for the wrong team." These people are simply unbelievable. I have previously blogged about American servicemen in Iraq and Afghanistan who showed courage and determination in combat and sometimes received our nation's highest award for valor. However, stories like the following help us to remember that our allies in these wars have outstanding men serving in their armed forces as well. Read the story of Sergeant Dipprasad Pun, a member of a British Ghurka regiment serving in Afghanistan. 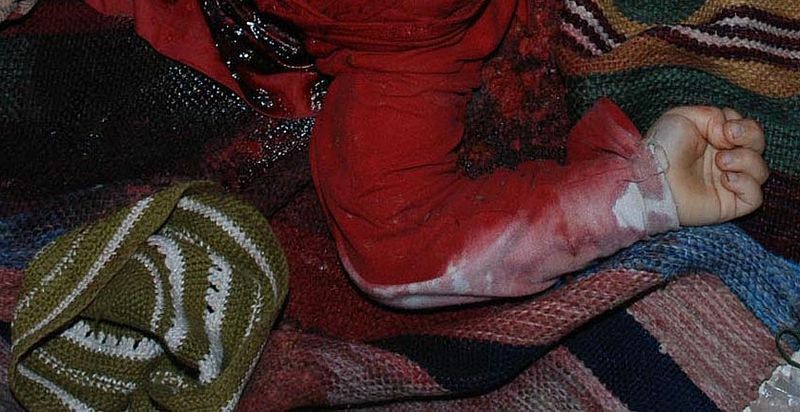 Last summer, he took on 30 Taliban attackers, and came out alive. At least three of his attackers did not. If nothing else, read the article and watch the video to find out why Sergeant Prasad yelled the exclamation that titles this post. With Libya, Obama can't even say, "Bush did it too!" In 2003, when President Bush unleashed the Gods of War on Iraq, he had first obtained clear and overwhelming consent from the U.S. Congress - Democrats included. You can disagree with his reasons for going there, but you cannot disagree that he didn't send U.S. troops there all on his own. Can President Obama make the same claim about his actions toward Libya? Opinion seems to be pretty split in both major political parties about whether or not attacking Libya is the right idea, but that is exactly the point. Before Obama sent 100+ cruise missiles hurtling toward a sovereign country, he should have waited for the people's elected representatives to debate this issue and consent to any action before spending the smallest amount of blood or treasure on this little endeavor. The U.S. Constitution says in Article I, Section 8, Clause 11 that only the Congress may declare war. I am aware that the Congress hasn't declared war against a country since 1941 - and I don't like that one bit - but in the absence of an official declaration, shouldn't the president at least obtain some sort of resolution or consent from the legislative branch? Is that too much to ask? I am not the only one who thinks that the President of the United States should not act unilaterally when using military action. Does Libya currently pose an "imminent threat to the nation"? Are we currently bombing Libya in "self-defense"? To borrow the oft-used words of those on the Left, we are attacking a country that has not attacked us; a country that has done nothing to us. I am still waiting for tens of thousands of protesters to march down the Embarcadero or Market Street in San Francisco like they did when the U.S. invaded Iraq eight years ago. I am waiting for these protesters to be carrying signs showing Obama with bloody fangs and a Hitler mustache like all those signs depicted Bush all those years. Nothing yet. Where are you Lefties? Where is your consistency Lefties? Our Dear Leader was talking the other day to some of the Democrat party faithful. While he has to know that his soaring, yet empty, rhetoric no longer dazzles the disgruntled independents out there who voted for him but now wish they hadn't, he apparently still thinks (and probably rightly so) that he can charm the true believers out there. Is this guy for real? Unfortunately, there are still two groups out there who still eat out of this guy's hand: the true statist faithful, and over 9 out of 10 black Americans. These are the two groups of people who would read that quote and say, "Yeah, so?" 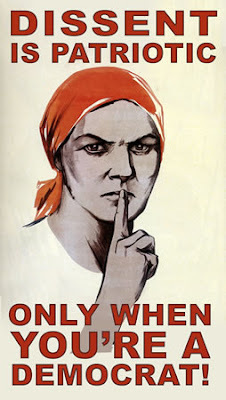 As for the rest of America, we can only shake our heads and wait for November 2012. "Which other country in the world has the oil reserves that Brazil has, that is not at war, that does not have an ethnic conflict, which respects contracts, has clear democratic principles and vision, is generous and in favour of peace?" Oh, I don't know, how about OURS?! Obama and company seem perfectly content to have us spend our treasure to buy oil from other countries and prop up their economies, but Lord forbid we should tap into our own supply, thereby opening up a massive supply of jobs, revenue, and this supposedly elusive energy independence to which the statists give lip service, but don't really want us to have. How is this for symbolism? After being open for only a year, Barack Obama Elementary School in Asbury Park, New Jersey is being closed. Two interesting actions have come to light this week in which our overlords in Washington D.C. are attempting to use the power of the federal government to intervene in something that should have nothing to do with the federal government. While I agree with Rep. Speier that bullying should be addressed, this issue is none of the federal government's business. This is a local issue, pure and simple. The article doesn't mention it, but I am sure Speier and other supporters would justify this proposed bullying law under either the Elementary and Secondary Education Act, or even more likely, the Individuals with Disabilities Education Act. Of course, since these two laws are also unconstitutional, piling more unconstitutional law on top of those doesn't change anything. Second Action: As impressively moronic and disturbing as the first item, this one is even more astonishing, and it comes right out of the White House. In a gross violation of privacy, President Obama, through his Department of Education, has threatened school principals with lawsuits if these principals do not set up a system for monitoring their students' Facebook activity, even if that activity is taking place during non-school hours! Something like this is always painted with a noble purpose; in this case to curb online harassment and bullying. The problem with this whole endeavor is two-fold. First, once again, this is not within the constitutional jurisdiction of the federal government. Second, since when is a school responsible for what its students do when they are not at school? It is terrible that online bullying occurs, however it is not the job of the principal to enforce student behavior when those students are at home. Once the student is home from school, the students' actions are now the province of parents and law enforcement. To expect school principals to take up this job is beyond ridiculous; it is downright Orwellian. Yet another action by our federal government to assume total control of our lives. If this is what you call slavery, then sign me up! The NFL is currently undergoing labor negotiations between players and owners. In truth, I don't really give a rip about the NFL or any other professional sports. If all professional sports were ended tomorrow, it wouldn't bother me all that much. I didn't used to think that way, but I have for about the last decade. Comments like the one made the other day by the players' union spokesman make me that much more cynical towards professional sports and the knuckleheads who dominate the rosters. It's modern-day slavery, you know? People kind of laugh at that, but there are people working at regular jobs who get treated the same way, too..."
Looks like Peterson skipped his history classes at the University of Oklahoma. For the record, Adrian Peterson's base salary with the Vikings is $10.72 million, and that is not counting his endorsement deals. The minimum base pay for an NFL player is $310,000, with that amount rising to $460,000 after two years. Slavery certainly has changed since the mid-19th century has it not? If Adrian Peterson is going to remain the NFL players union spokesmen, then what little sympathy these overpaid participants in a child's game currently receive, is going to shrivel up to nothing. There were and are many things I did not like about George W. Bush, but one line of his that I always thought was spot-on was his description of that other kind of expression of racism which he called the "soft bigotry of low expectations." He mostly used this term to describe the conditions in some of our schools where not as much is as expected from our minority students as far as academic performance and standards of proper behavior, but the concept can apply just about anywhere in American life. This soft bigotry is on full display right now in the city of Dayton, Ohio where, after too many blacks failed a Dayton Police Department entrance exam, Attorney General Eric Holder rushed his cronies into Dayton and told that city's government that they were going to have to lower their testing standards in order to ensure that more minority applicants qualified to be hired. This is by no means the first time something like this has been done in America, but I never cease to be amazed by the implications. What Eric Holder and the Justice Department is effectively admitting is that blacks are too stupid to attain the normal objective standards, so the standards will have to be lowered. Not only that, Holder's actions poison the potential careers of the black applicants who did meet the objective standards. Unless everyone's test scores are out in the open, which I am assuming they will not be, then how is one to know which black members of the Dayton Police Department truly made it on their own intelligence and hard work, and which ones are substandard, but were allowed to sneak through by the Justice Department in the name of racial equity? If I were one of the black applicants who legitimately made it, I would be mad as hell that I will automatically lumped in with those who didn't legitimately make it. What is also insulting, not only to the applicants, but to the city of Dayton, is that the passing scores for this exam have been lowered by the Justice Department to the equivalent of an F grade. What kind of effect will this have on the quality of policing in Dayton? If the city leaders of Dayton, Ohio have any integrity, any fortitude, they will tell the federal Justice Department to mind its own business and go back to Washington D.C. This is a local police force, a local matter. Even if this situation did involve the federal government, where is the civil rights violation? In typical Alice-in-Wonderland fashion, applying a single standard to everyone is considered by the Justice Department to be a civil rights violation, while using different standards to accommodate designated groups of people is considered a-ok.
That Eric Holder would take these actions in the Dayton case is unsurprising. His mollycoddling of the New Black Panthers in their voter intimidation case from the 2008 election, and his description of black Americans as "my people" in recent congressional testimony make it quite clear where Holder's true allegiances lie. For Eric Holder, race takes precedence over the rule of law, while in the process, he insults the race he supposedly loves through his soft bigotry of low expectations. In Israel on Friday (Saturday there), Palestinian Muslim murderers snuck into a Jewish home in the dead of night and killed five members of a family, including both parents, an 11-year old, a 4-year old, and a 3-MONTH old baby. Pamela Gellar at Atlas Shrugged has crime (terrorist) scene photos posted, which might seem macabre were it not for the fact that family members of the deceased authorized Gellar to post the photos so that one may truly see the face of evil, and what to see what the Israelis face every day as they are surrounded by people who want to see every one of them dead. I posted the least offensive of the photos (that hand belongs to the 4-year old), but I couldn't bring myself to post any of the others. The standard operating procedure at this point is for Muslim apologists and Palestinian apologists to insist that this was just an isolated incident and we shouldn't make a blanket judgement based on the actions of a few. That argument might hold a bit more water were it not for the fact that as soon as word of this barbaric attack made the rounds in Gaza, people began celebrating in the streets and handing out sweets. There are a couple people in my circle of coworkers, family, and friends who complain about the Israelis and talk about the raw deal the Palestinians have. I'm not quite sure how they would defend this. When I watched coverage of the Indonesian tsunami on the day after Christmas in 2004, I figured I was watching a once-in-a-lifetime event. How wrong I was. Here we are, less than a decade later, and our televisions have once again been jam packed with the incredible and tragic images of Mother Nature's indifferent fury. When the Republicans recently suggested trimming a paltry $32 billion dollars from Obama's budget-busting $1.65 trillion dollar deficit, even that insignificant sum of money proposed by the Republicans proved too much for Senate Majority Leader Harry Reid (who I find to be one of the most repulsive people in recent memory). Reid called the cuts "draconian" and "unworkable." You know what this means? Harry Reid thinks it is more important that I fork over my hard-earned money to support these poetry-spouting cowboys than it is to be able to contribute to my kids' college funds or to fix the broken air conditioner in my car. I continue to be astounded by how out-of-touch these bastards are. I just ran across an article that reminded me of an incredible statistic that I heard before but about which I have gotten around to blogging. California is the Union's most populous state, with approximately 38 million people. Incredibly enough, 50% of California's income tax revenues are paid by a mere 144,000 people. The other 50% is paid by the other 37, 856,000. That 144,000 - which represents the top 1% of income earners in this state - represents a mere .004% of our state's population. I even remember former Governor Schwarzenegger mentioning this statistic when I attended his State of the State Speech just over a year ago. Just as disturbing, 144,000 just happens to also be the number of households that leave California every year in search of greener pastures. Thank goodness these two groups of 144,000 are not necessarily one and the same. Nevertheless, it still seems like our Democrat-dominated state government is bound and determined to poke and prod the 144,000 mega-taxpayers into leaving. Think you have a boss at your job who is tough to work for? Thank your lucky stars that your boss is not Congresswoman Sheila Jackson-Lee (Democrat-Texas). I have heard horror stories about her before - such as the famous "I expect to be treated like a queen" incident - but this article, which mentions that incident, puts all the horror stories together in one astonishing narrative. Remember folks, this woman votes on legislation that affects all of us. So when do we impeach Obama for the gas prices? I continue to marvel at the people who give our Dear Leader a pass over the same issues for which they wanted to keel haul George W. Bush. There is Guantanamo; the continued presence of American troops in Iraq and Afghanistan; and enforcement of the Patriot Act, however, one that I see overlooked so far is gas prices. I took that photo at a protest in Sacramento on August 5, 2006 during the short war between Israel and Hezbollah in Lebanon. As often happens with these protests, the signs come out for all kinds of issues, even if they have nothing to do with the reason for the protest. 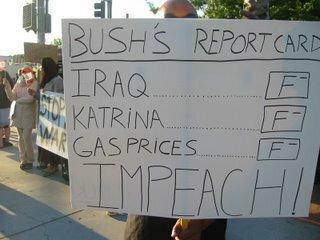 Now, notice that one of the reasons why this particular protester thought Bush should be impeached was because of gas prices; and if you will remember, gas prices were a common complaint about our 43rd president. $3.38, why should we not follow this sign-holder's advice and impeach President Obama? I of course am being absurd in order to illustrate other people's absurdity. I realize that there are too many factors that determine the price of gasoline to just blame it all on the President of the United States. On the other hand, it certainly doesn't help that Obama only just today supposedly allowed drilling in the Gulf of Mexico to resume, even though he lifted a drilling moratorium back in October but wasn't handing out any permits. The bottom line is that our illustrious president continues to either not be held accountable, or not be held to blame for the very same things for which President Bush was pursued with a hay hook. There are many positions George W. Bush took with which I did not agree. My question is why was Bush rightly excoriated for these positions by the media, when Obama is not when doing the very same thing? That question is rhetorical by the way. It is a simple matter of the Old Left Media supporting Obama and hating Bush, thus Bush's missteps are thoroughly reported, whereas Obama's missteps are largely overlooked. After starting the count with 4,734,991, the last remaining American veteran of World War I has died. Frank Buckles was a Corporal in the U.S. Army when the Great War ended on November 11, 1918. Buckles lied about his age in order to enter service as an ambulance driver, so at age 16 or 17, he was quite a young buck when he served "Over There." Buckles wasn't done with world wars, however. He was working in the Philippines in 1941 when the Japanese invaded that country. Buckles ended up spending World War II in a Japanese prison camp that had been set up to house foreign civilians. I can imagine the abuse his body withstood, what with malnutrition and exposure, which makes his longevity all the more amazing. Being born on February 1, 1901, I have given thought to what Buckles's age means. He was 7 months old when President William McKinley was assassinated. He was 11 years old when he saw headlines in the newspaper about the Titanic sinking in the North Atlantic. He had the opportunity to talk to plenty of Civil War veterans, who were only in their 70s by the time he was old enough to comprehend what they had to tell him. He was born only three years after the end of the Spanish-American War, and as a child, was old enough to remember Teddy Roosevelt being president. The Wright Brothers flew their first flight when Buckles was almost 3 years old, and he lived to see the end of the Space Shuttle program. In the year of his birth, someone who died that same year who was the same age Buckles was when he died, would have been born in 1791 when George Washington was only two years into his presidency. He was born 112 years after the Constitution went into effect in our country, which means, having died at the age of 110, his life spanned just under half of our country's existence under the Constitution. And my favorite statistic: When Buckles was my age, the year was only 1940. That means if I live as long as he did, if the year was 1940 right now, I still have until 2011! Rest in Peace Mr. Buckles.